Phalaborwa is a town situated in the Mopani District Municipality, Limpopo province, South Africa. Kick off your visit on the 5th (Sun): play a few rounds at Hans Merensky Golf Course. Get ready for a full day of sightseeing on the next day: do a tasting at Amarula Lapa and then sample the fine beverages at Qualito Craft Distillery. To find more things to do, ratings, reviews, and other tourist information, you can read our Phalaborwa journey planning app . Berlin, Germany to Phalaborwa is an approximately 26-hour flight. Traveling from Berlin to Phalaborwa, you'll lose 1 hour due to the time zone difference. In April in Phalaborwa, expect temperatures between 30°C during the day and 17°C at night. On the 6th (Mon), wrap the sightseeing up by early afternoon so you can travel to Inhassoro. Inhassoro is a small fishing port in Inhassoro District of Inhambane Province in Mozambique. 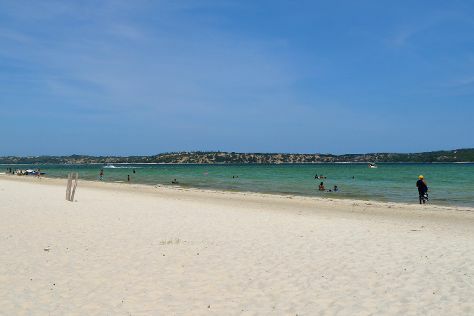 Kick off your visit on the 7th (Tue): kick back and relax at Inhassoro Beach. For photos, ratings, more things to do, and tourist information, refer to the Inhassoro online trip planner . You can drive from Phalaborwa to Inhassoro in 12.5 hours. Traveling from Phalaborwa in April, you can expect nighttime temperatures to be somewhat warmer in Inhassoro, with lows of 22°C. Cap off your sightseeing on the 8th (Wed) early enough to go by car to Vilanculos. Start off your visit on the 8th (Wed): browse the exhibits of Machilla Magic and then see some colorful creatures with a scuba or snorkeling tour. To see maps, reviews, where to stay, and other tourist information, go to the Vilanculos trip planning site . You can drive from Inhassoro to Vilanculos in 1.5 hours. In April in Vilanculos, expect temperatures between 32°C during the day and 22°C at night. Finish your sightseeing early on the 9th (Thu) to allow enough time to travel to Tofo. On the 9th (Thu), stroll through Marine Megafauna Foundation and then see some colorful creatures with a scuba or snorkeling tour. Get ready for a full day of sightseeing on the next day: explore the striking landscape of Bazaruto National Park. To find photos, other places to visit, where to stay, and other tourist information, refer to the Tofo trip planner . Do a combination of flight and car from Vilanculos to Tofo in an hour. Alternatively, you can drive. Expect a daytime high around 34°C in April, and nighttime lows around 24°C. Wrap up your sightseeing on the 11th (Sat) to allow time to drive to Xai-Xai. Xai-Xai is a city in the south of Mozambique. Kick off your visit on the 11th (Sat): explore the activities along Bilene. To find where to stay, ratings, more things to do, and more tourist information, use the Xai-Xai holiday planner. Drive from Tofo to Xai-Xai in 4.5 hours. Alternatively, you can do a combination of car and bus. In April, daily temperatures in Xai-Xai can reach 32°C, while at night they dip to 24°C. You'll set off for home on the 12th (Sun).